Welcome to language-easy.org! So, as you have chosen this article, I suppose that you are ready to enter the depth of German grammar. In the following you will notice, of what essential importance German Accusative is. For sure, many of you get confused with all the articles that exist in German. Especially compared to the English language, there is a huge variety of articles. Of course, you have noticed that they depend on the gender, the number and the case of the they are attached to. But, don’t worry. In this article I’d like to try to clear a little bit why and when you chose a certain grammatical case and the corresponding article. For now, we will focus on the German accusative case. First of all, we will try to clear up what the German accusative actually is. After that, we will look at its usage and also at the articles that correspond to this grammatical case. What is the German accusative case? Was ist der Akkusativ im Deutschen? First of all, we have to clear up what the German accusative case actually is. So, let’s use an example phrase to illustrate the German accusative. “Der Junge sieht die Biene.” – The boy sees a bee. Well, in this example phrase, “die Biene” represents the German accusative case. So, the accusative word in a sentence is the direct object, the person or thing being acted upon. Although the article “die” of “Biene” seems like a normal direct singular feminine article, it is also the accusative forms. Well, in other cases you will see that the articles does change from its “normal” form. “Der Junge sieht sie” – The boy sees her. Here, you can see how “die Biene” is replaced by the accusative pronoun “sie”. Actually, these changes are quite familiar to you as the same happens in the English language. Nevertheless, I’d like to show you a list of German accusative pronouns in the following. So, we will come to the next part of this article and talk about the usage of German accusative in the following. By the way, in case you want to have some background information about German accusative, just have a look at this article on Wikipedia. Of course, we will have to clear up when to use the accusative case. Well, for German speaker it is quite easy. 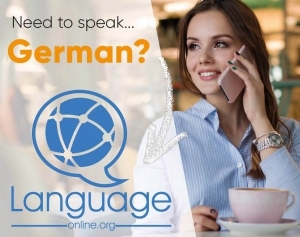 Maybe, you have heard, that German simply ask the question “Wen order was?” and the answers shows them, what the accusative word in the sentence is. Unfortunately, this kind of determining the German accusative case in a sentences does not make any sense the non-German-speakers. But, don’t worry, there are basically three other ways to determine whether the German accusative is needed or not. First, you have to use the German accusative case after certain verbs. Well, you simply have to learn those verbs by using verb lists or other methods. Second, there are prepositions that imply the German accusative after them. Exactly, you also have no other chance to master them than studying hard. Last but not least, we use the German accusative as the direct object in sentences with more than one object. So, as a last point about the German accusative, we should talk about the declension of nouns in the accusative. Well, as I have already mentioned, the declension, and so the article of the noun, is influenced by gender, number and case. Exactly, we are talking about masculine, feminine and neuter, plural and singular and, of course, everything in the accusative case. 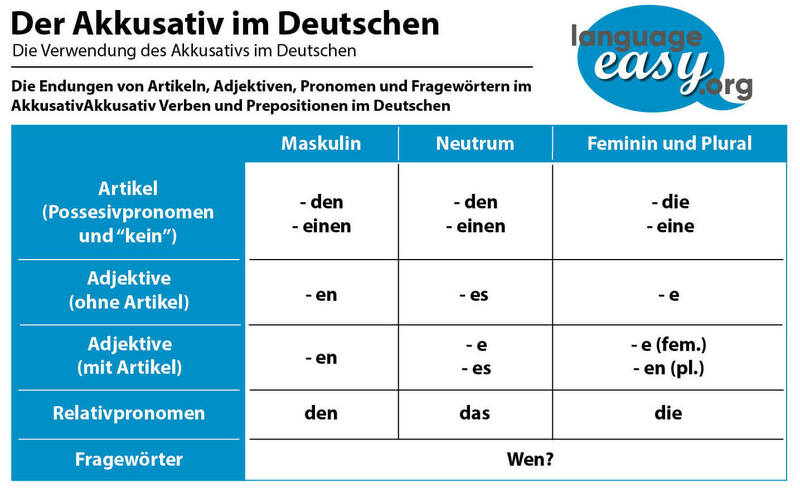 In the following table I’d like to show you the declension of German accusative nouns with definite and indefinite articles. Well, we have come to the end of this article about German accusative. Hopefully, you have archived the information you were looking for. Furthermore, I hope that I could clear up the basic principles of this German case its definition and its correct usage. Please, keep in mind that German can only be master if you put a lot of effort in it – so keep on studying, studying and studying. And now, auf Wiedersehen!